Many people who have seen TWO SPIRITS want to learn more about the important historical figure We’wha (WAY-wah). In 1886 Washington, D.C. was emerging as the metropolitan capital of a growing nation. The trauma of the Civil War was past; industrialization and urbanization were in full swing. In the West, the last Indian tribes had been defeated. America had achieved its so-called “manifest destiny.” Now it was beginning to face the consequences of rapid growth and settlement. In Washington, a new generation of young professionals was eager to tackle these problems, especially the exploration of the West and its resources, including understanding more about its vanishing native people. Prominent among these were the anthropologists Matilda Coxe Stevenson, one of America’s first women scientists, and her rival, Frank Hamilton Cushing, an eccentric young man fascinated with native people since his childhood. Four years earlier Cushing had brought a delegation of Zuni Indians on a much-publicized tour of the eastern United States. Stevenson decided she had to keep up, and so early that year she brought a remarkable cultural ambassador to the nation’s capital. The Zuni “princess” We’wha (WAY-wah), as the local papers dubbed her, was an instant celebrity. Throughout the spring of 1886, she mingled with politicians, government officials, politicians, and the local elite. She befriended the speaker of the house and called on his wife. She demonstrated Zuni weaving on the Mall and worked with anthropologists at the Smithsonian Institution. She even appeared in a charity event at the National Theatre before an audience of senators, congressmen, Supreme Court justices, and the president. Finally, in early June, she paid a personal call on President Cleveland himself. At six feet, the Zuni “princess” was one of the tallest and, according to Stevenson, strongest members of her tribe. 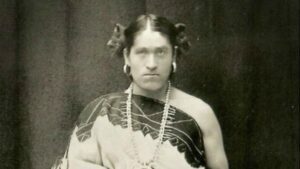 No one in Washington doubted that the visitor from Zuni was a woman, but, in fact, We’wha was born a man. We’wha grew up as an individual who combined male and female traits in a socially-recognized third gender role. Two-spirit people often held honored and influential positions. We’wha was an accomplished potter and weaver, and a recognized expert in Zuni religion. That such an individual could become a representative for the Zuni tribe underscores the degree to which individual differences in gender and sexuality were accepted at the time. In most tribes the ability to combine male and female skills and qualities was not viewed as a liability but as a gift. It came as no surprise to the Zunis that We’wha would travel thousands of miles, overcoming the obstacles of language and culture, to live and mingle with the leaders of a powerful nation. Someone like We’wha was expected to be extraordinary. Read more in the book The Zuni Man-Woman by Will Roscoe, recipient of the Margaret Mead Award from the American Anthropological Association and the Society of Applied Anthropology, and a Lambda Literary Award for nonfiction.